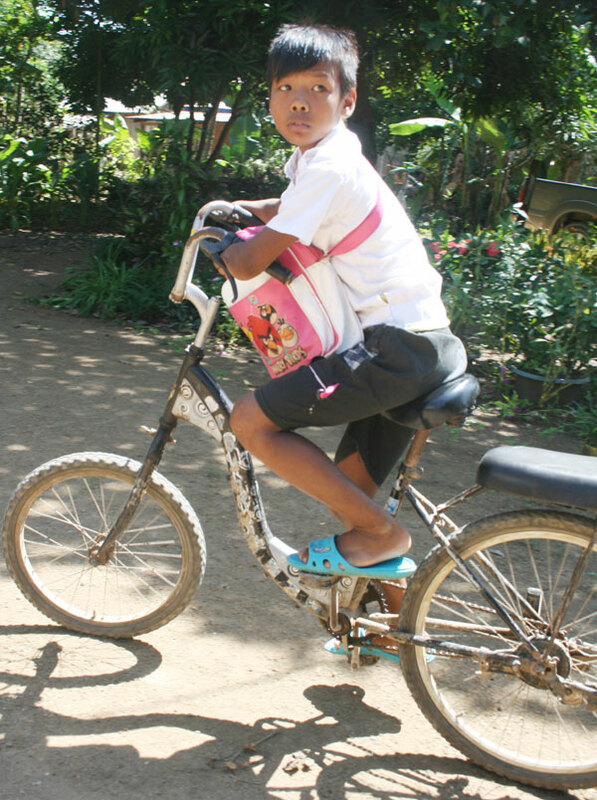 Sokheng rides to school on a bicycle provided with UNICEF support. Three years ago Phorn Sokheng was a happy and bright student at his primary school in Chhoeu Tiel village in Sampov Loun district of Battambang province (northwest Cambodia). Aged 9 he liked nothing more than playing with toy cars, especially dismantling and reassembling them. This pastime was to change his life. Refrerral Hospital has increased the uptake of paediatric and HIV care. 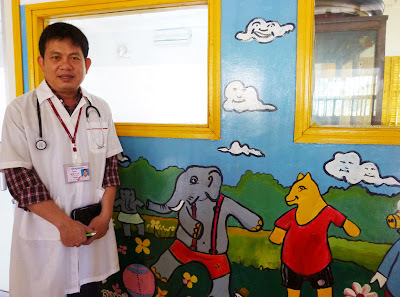 When asked about his HIV patients, Dr. Chea Pov, the director of the pediatric ward at Battambang’s Referral Hospital, remembers a 9-year-old boy named Luos Tola, whom he met five years ago. Dr Pov recalls that the child was so weak that he could not walk or speak, “He looked like he was already dead.” However, after a month at the hospital, thanks to antiretroviral treatment that stops HIV from destroying the immune system, as well as antibiotics to fight tuberculosis, Tola started walking again. 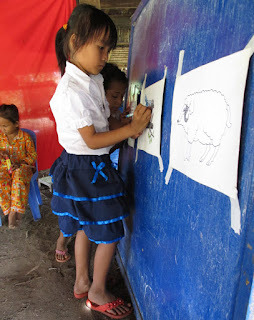 Davith draws pictures of animals at Krouch Community Pre-School. 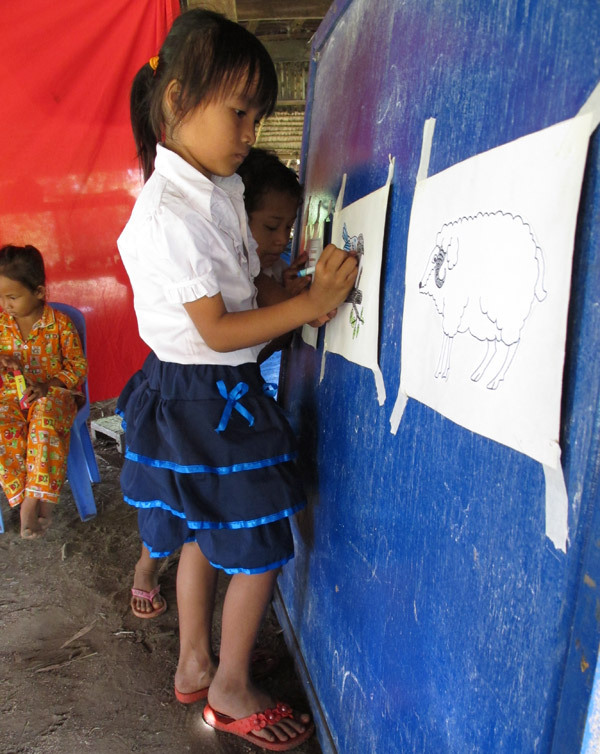 Six year old, Yan Davith, is one of 15 children attending a community pre-school in Prey Sak village in rural Kampong Cham province, three hours north-east of the capital, Phnom Penh. Although she only joined the pre-school in October last year when she was five-years-old, Davith’s social skills have greatly improved. She attends the community pre-school from 7.00 a.m. to 9.00 a.m., Mondays to Wednesdays, and Fridays and Saturdays. 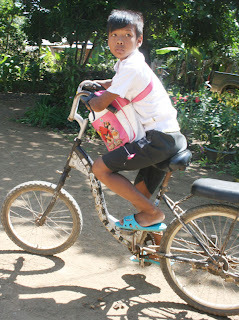 She is looking forward to starting Krouch Primary School next year, and already has big plans for the future. 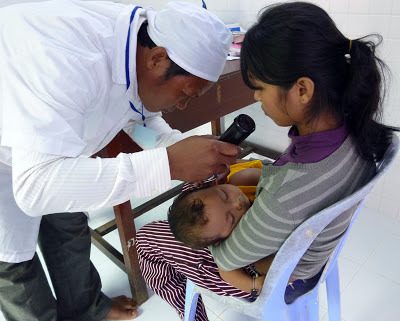 Health care worker, Kong Sokhai, examines baby Sakada. It is Wednesday morning in Battambang province, just over almost 300 kilometres north of the Cambodian capital, Phnom Penh, and baby Ron Sakada, who has a cough and a runny nose, waits in his mother’s lap at the Russey Kraing Health Centre. 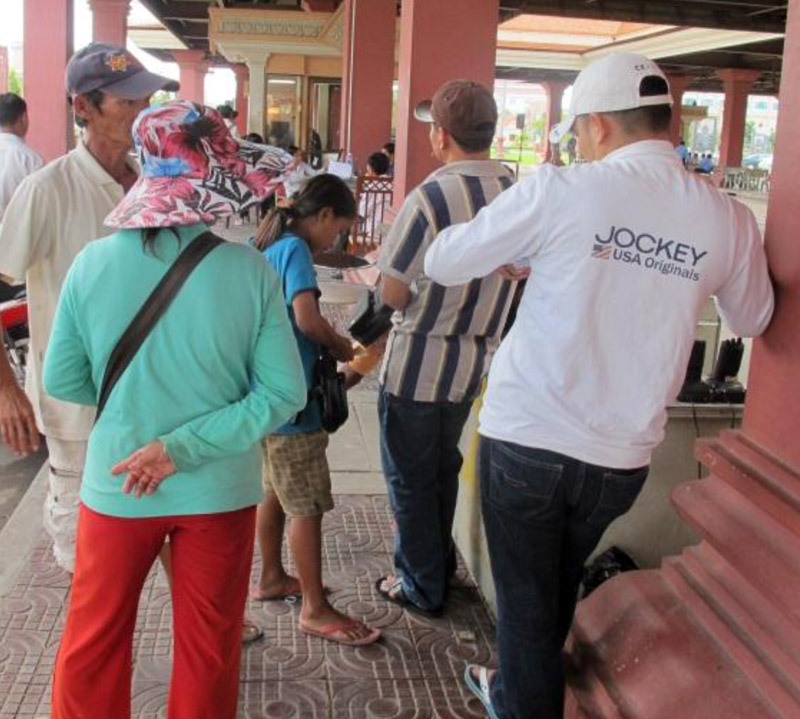 Sovannara in beige shorts sells lottery tickets to buyers. Ang Sovannara* attends primary school and sells lottery tickets at the Vietnam/Cambodia border every day in Svay Rieng province. “My name is Ang Sovannara and I’m 10 years-old. I live in a small house with two rooms. The house has black walls and a zinc roof. There is a separate toilet and bathroom. Three people sleep in one room and another three people sleep in another room. I have seven siblings and the oldest is married and lives in a separate house. My parents live in a separate house.